I haven't posted for a while but I'm up and running again. I was browsing the catalogue and saw the emberella listing for the stamp (label) described below (cut and pasted for your convenience). Thought it would be a nice one to have. I find their website a bit confusing since it seems you have to order sheets. Can anyone clarify how to get one - or, if someone has already bought sheets, does anyone have one to sell? Issued in memory of Sir Terry Pratchett (1948.04.28 - 2015.03.12). All proceedings through philatelic or international sales of this issue will be donated to UNICEF, with Posta tal Musograd doubling the amount donated. I designed some stamps and got them printed from the site for the Fforde Ffiesta. You should email Juergen [js@yourstamps.de] on what you require. Maybe we could club together and buy a sheet, then split it between us? Yes - I was wondering about doing something like that myself. I'll make enquiries and report back. Meanwhile, if peeps can PM me if they're interested to give me some idea of numbers. Further to earlier messages I have now purchased a sheet of 24 of the Sir Terry Memorial stamps. The sheet is made up of 4 across and 6 down. There are no printing or other marks on the plain white selvedge that surround the sheet. Please PM me with your requirements - first come first served. I will probably wait a week or so before posting just to give me a chance of maximising people's requirements from the sheet (I've also got a busy couple of weeks in any case). I will reply if there are any problems and let you know when they're posted. Sheet of 24 = £12.00 + P&P £3.30 = £15.30 works out at 0.6375p per stamp rounded to 64p each. 2nd Class postage is 55p. 64p + 55p = £1.19 per stamp. I'll round this up to £1.20 and that'll cover the envelopes and packing, ink and shoe leather going to the PO. LOL. I'm not trying to make a profit out of this but I may put any leftovers on Ebay at some in the future. Sorry - forgot to say I will accept payment by cheque or paypal. I'll give details when you apply. 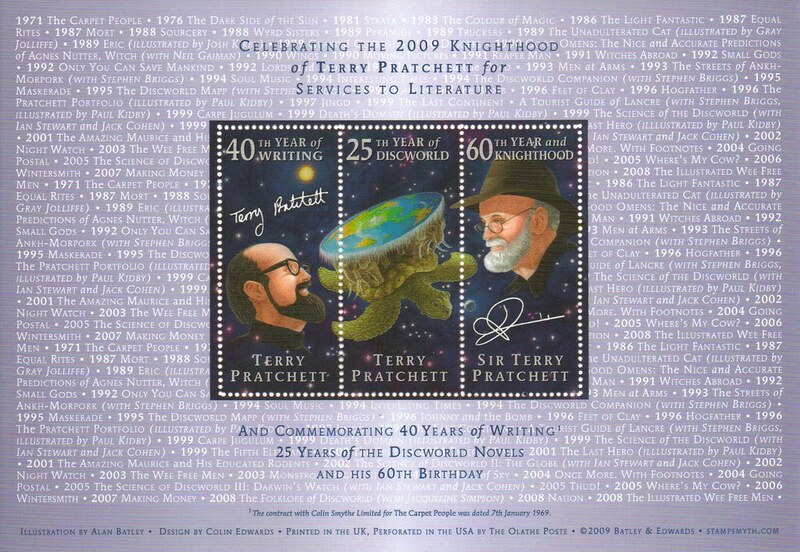 There was a previous Sir Terry stamp issue. 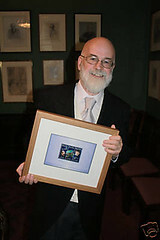 2009 was a notable year for Terry Pratchett. After 19th February he would be Sir Terry Pratchett no less. But not only that, but it marked 40 years of writing novels (the first being Carpet People), 25 years of Discworld novels, and also his 60th Birthday.